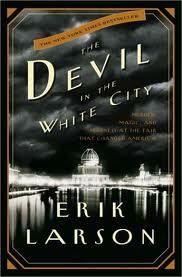 “Late last year, Leonardo DiCaprio and his production company, Appian Way (along with Double Features), picked up the rights to Erik Larson’s “The Devil in the White City: Murder, Magic and Madness at The Fair that Changed the World.” Larson’s non-fiction work is told in a more traditionally novelistic way, and it chronicles the story of one of America’s first serial killers, Dr. HH Holmes. Holmes was a charmer who used the Fair and a so-called “murder castle” to draw in his prey. Once in his home, he would use a number of terrifying contraptions to murder people, only to turn around and sell their skeletons for medical and scientific study. He’s believed to be responsible for at least twenty-seven murders, and as many as two hundred. Larson’s book also makes use of time period’s backdrop – the 1893 World’s Fair in Chicago. The book revolves around two men – Holmes and Daniel Burnham (the “chief architect” of the fair). DiCaprio is so passionate about the story that, not only did he buy the rights for the book, he also signed on for the complicated role of Holmes. But despite a story and star, the project was missing one key element – a screenwriter. Now, however, Warner Bros. has picked up the rights for the book from Appian Way and Double Features (who will produce the project) and hired a scribe for the project – rising star Graham Moore. This sounds very interesting. Would love to see DiCaprio play a serial killer.